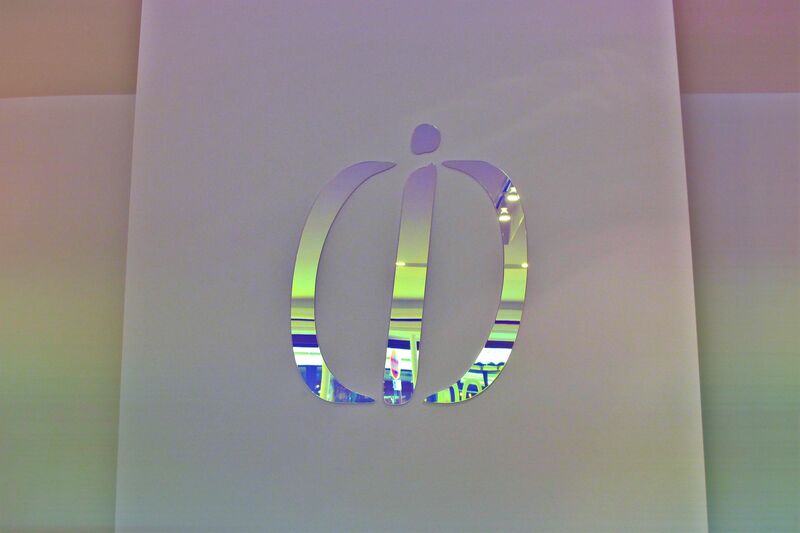 Posted on September 17, 2014 by Karin Shibata Posted in Macaron	. 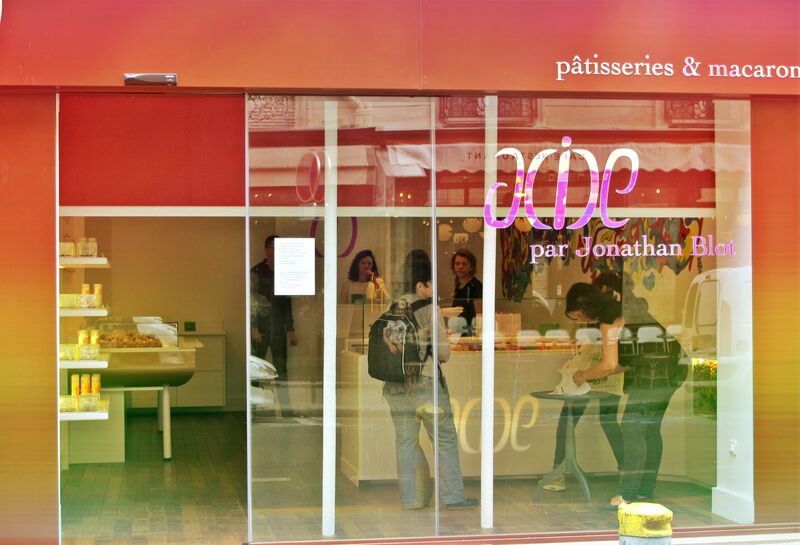 Jonathan Blot opens a new Acide Macaron shop near the Seine river (the first shop transformed into a tea salon). La boutique nouvelle boutique Rue du Bac. 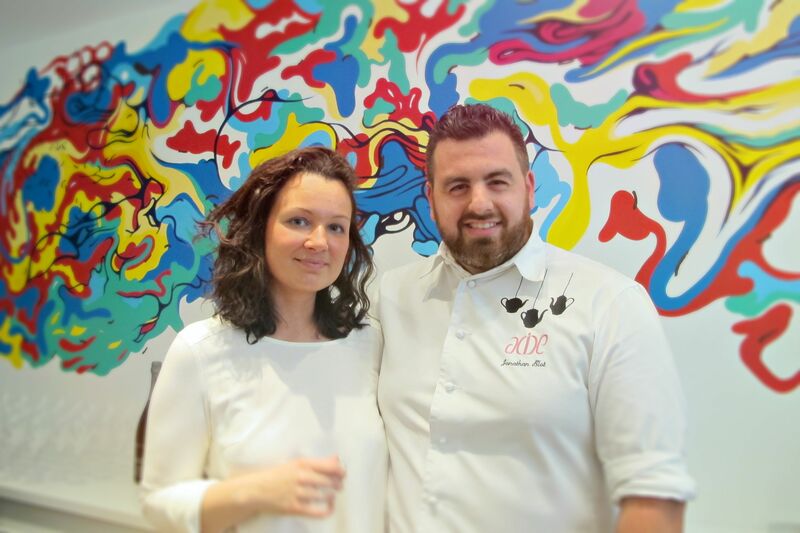 Un décor épuré, coloré et street-art avec la belle Renata Blot qui illumine la salle. A pop, colourful, chic and street-art (Nawi) decorated shop. 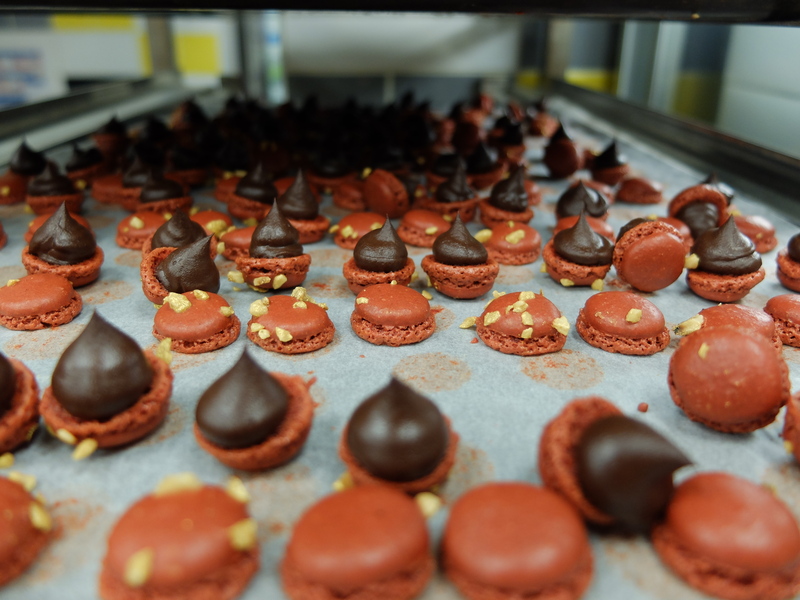 Jonathan Blot’s signature pastry is macaroons. He opened his first store in 2009 with his wife Renata at 25 years old !!! Inspired by contemporary art and his Armenian-Lebanese origins, flavours have oriental inspiration. An ode to his wife Renata, a green tea and jasmine combination. 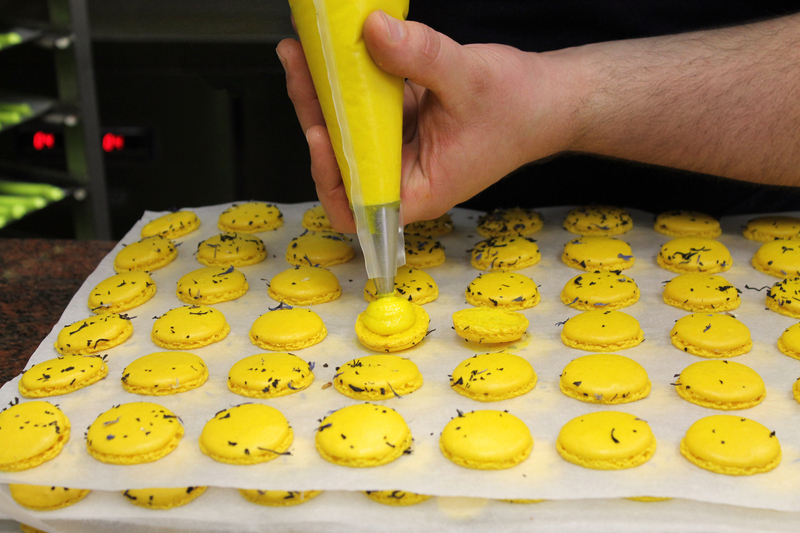 The iconic “Acide” macaron is a mix of passion fruit and citric acid. There is a limited edition flavour each week. 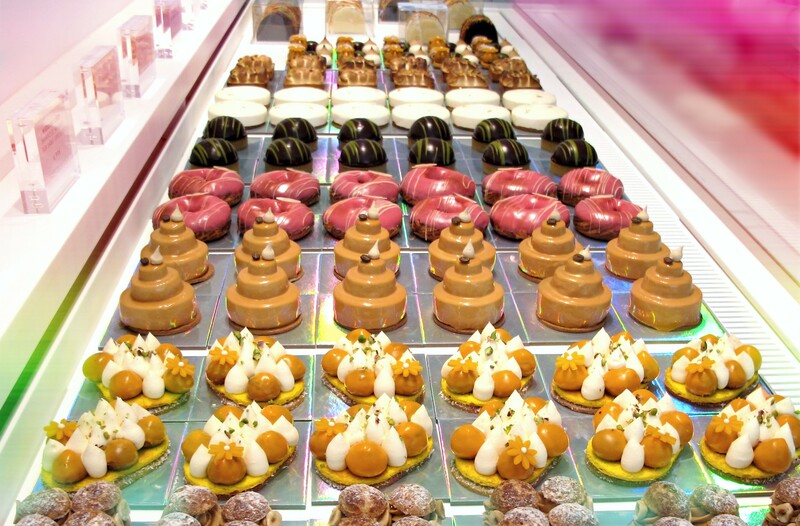 Des pâtisseries créatives, colorés et aux saveurs détonnantes. 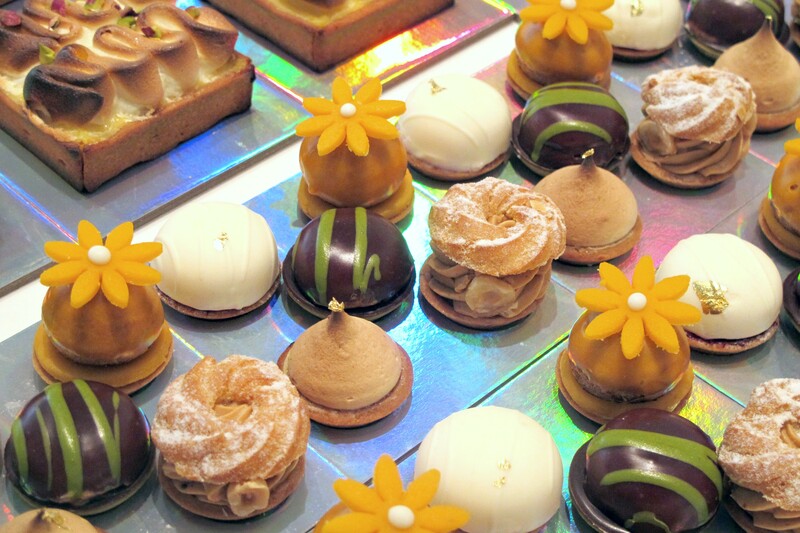 Pastries are creative, colourful with originals flavours. Choux à la mangue, chutney d’ananas à la vanille sur biscuit à la noix de coco. 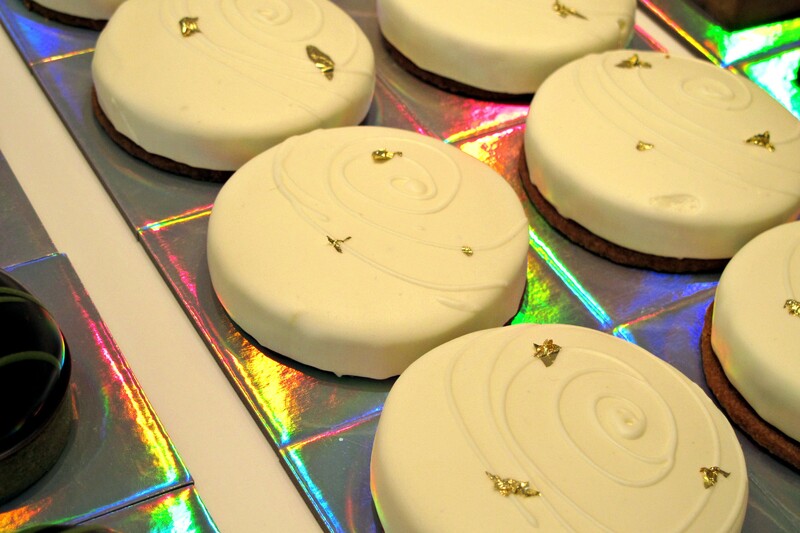 An exotic vision of the classical Saint-Honoré. Mango, pineapple and coconut flavours for this sweet pastry. 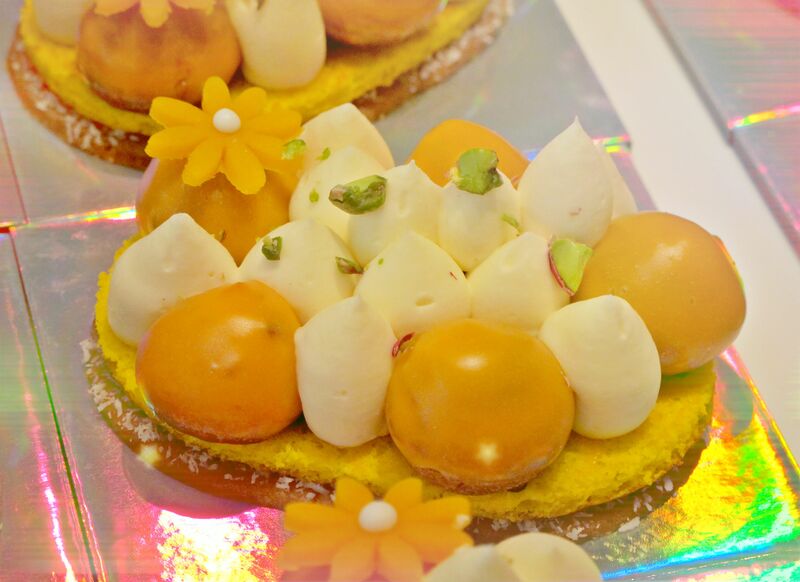 Pâte à chou Marguerite, mousseline à la noisettes du Piémont IGP, feuilletine croustillante et praliné coulant. 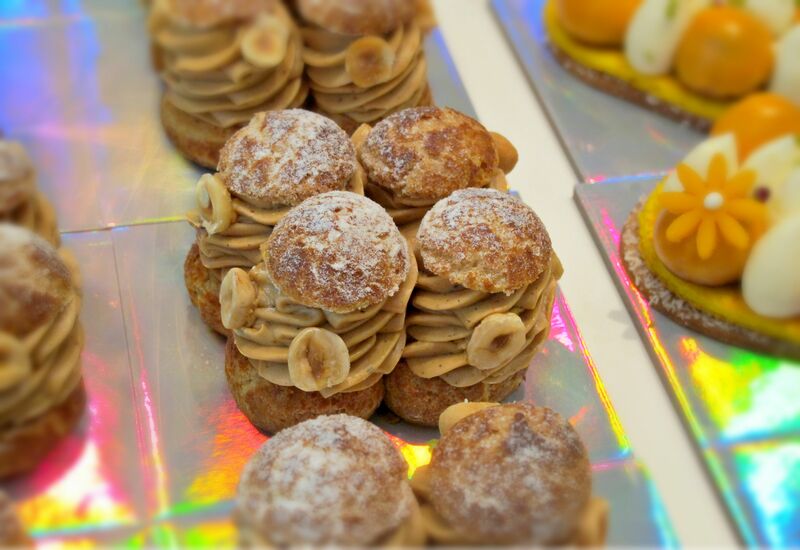 The Paris-Brest travelling to Italy with a pronounced nutty flavours. The crispy praline is unexpected and good. Sablé Spéculos, bavaroise au café bio et Pain de Gênes à l’expresso. This is the girl’s dream cake ! A mini wedding cake for yourself !!! The idea is very cute and the coffee is organic. 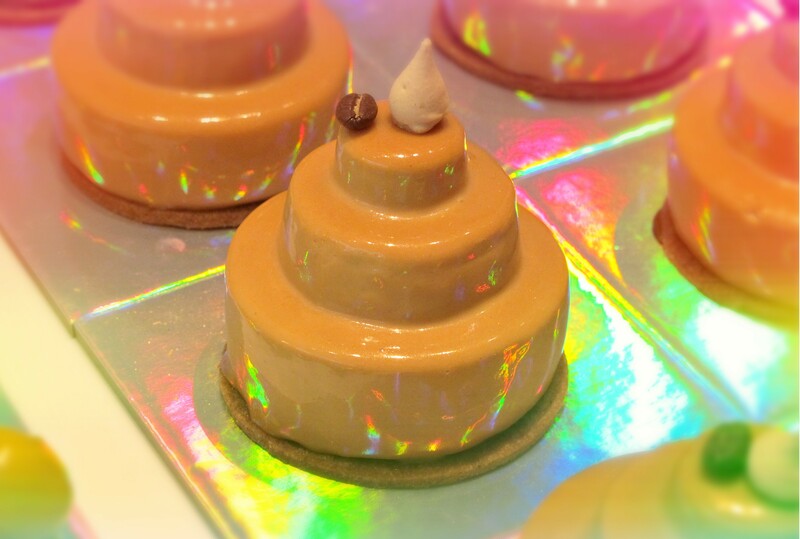 Sablé deux cuissons, écrasé de baie de cassis sauvage et mousse onctueuse de cream cheese. The creaminess of the cheesecake pairing with blackcurrant acidity. 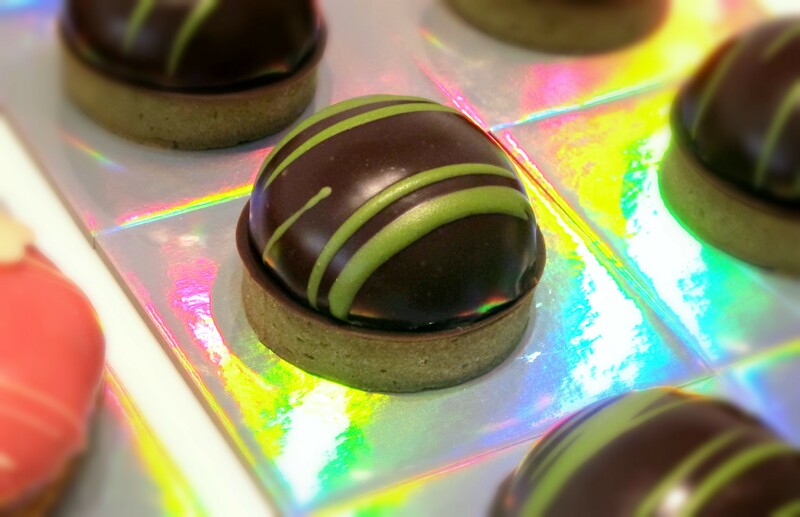 A chocolate tart with green and white tea. What a mix for tea time. 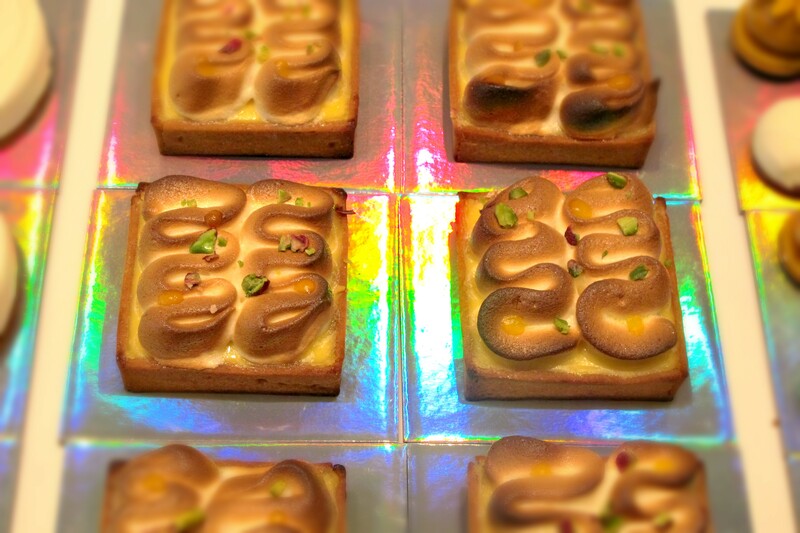 Pâte sucrée, crémeux au zeste de citron de Sicile et meringue au jus de Yuzu sauvage. A lemon pie with Sicilian lemons and Japanese Yuzu. A tasty duet. Donuts garni d’un crémeax au pop-corn et son célèbre glaçage. 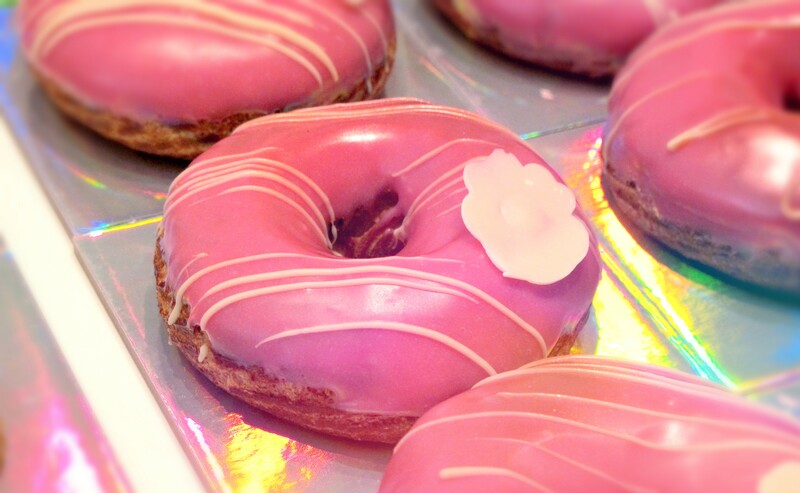 A French donut with a pop-corn creamy filling ! The “guilty pleasures”… These signatures are so cute… Minimize you sweet delights…. Tags: gift, macaron, Paris 17, Paris 7, pastry, tea time	. 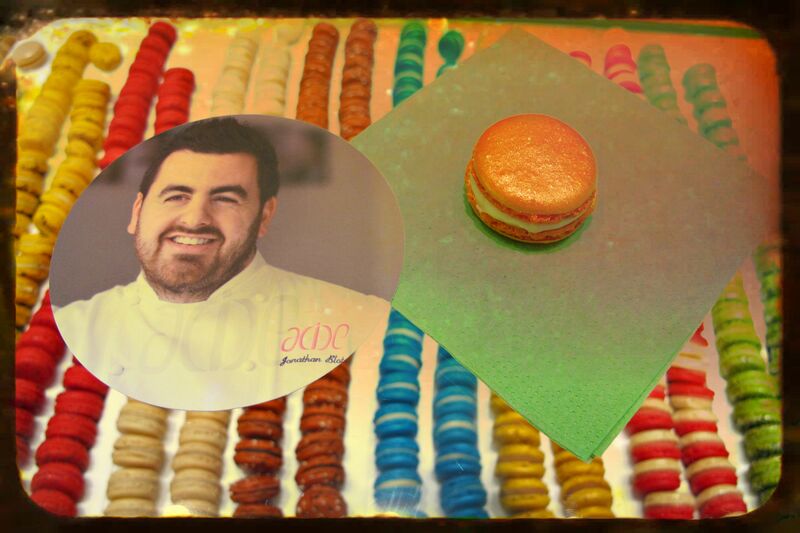 NEW #PASTRY SHOP in #Paris- Opening of the new #Acide #Macaron shop ! Sawako Mochizuki liked this on Facebook. Saeko Ichiriki liked this on Facebook. Yann Rugaru liked this on Facebook. Shigeyiki Kaneda liked this on Facebook. Alex Paillé liked this on Facebook. Tibaldo Gv liked this on Facebook. Ali Soltani liked this on Facebook. 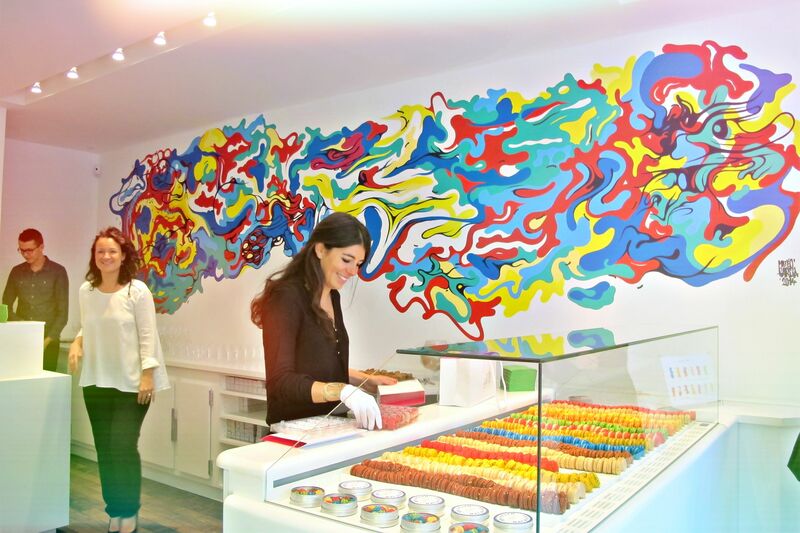 RT @ShibataKarin: NEW #PASTRY SHOP in #Paris- Opening of the new #Acide #Macaron shop ! Emmanuelle Deguette liked this on Facebook. Nao Kaneko liked this on Facebook. Sari Shafiei liked this on Facebook. Katsuharu sato liked this on Facebook. Jane SC liked this on Facebook. Nasrine Panahi liked this on Facebook. Gabriel Bestiole liked this on Facebook. Nadia Ouhoud liked this on Facebook.